InterConnections 21 is collaborating with Off Square Theatre Company to present a staged reading of OSLO. IC21 thoroughly embraces the role of arts and culture in fostering greater awareness and engagement with international affairs. 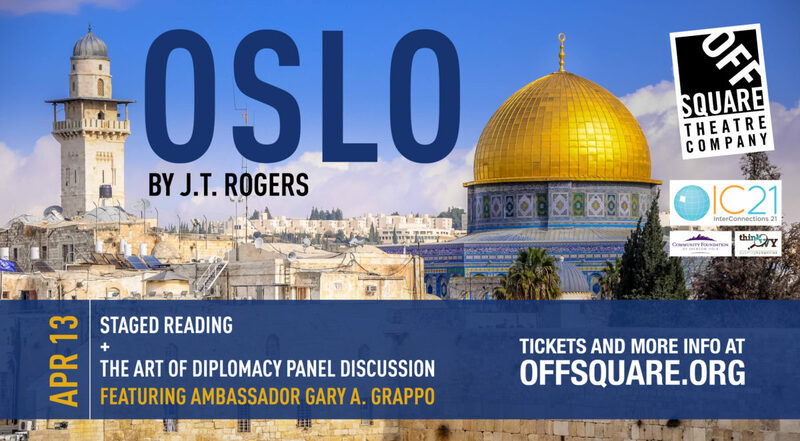 OSLO provides a unique perspective into the behind the scenes personal action surrounding the globally-significant collaboration and diplomacy of the Israeli-Palestinian peace accords. One of the most stunning and iconic moments in world politics happened in 1993 when Israeli Prime Minister Yitzhak Rabin and PLO Chairman Yasser Arafat shook hands on the South Lawn of the White House. Among the many questions that laced the hope of the moment was that of Norway’s role. How did such high-profile negotiations come to be held secretly in a castle in the middle of a forest outside Oslo? 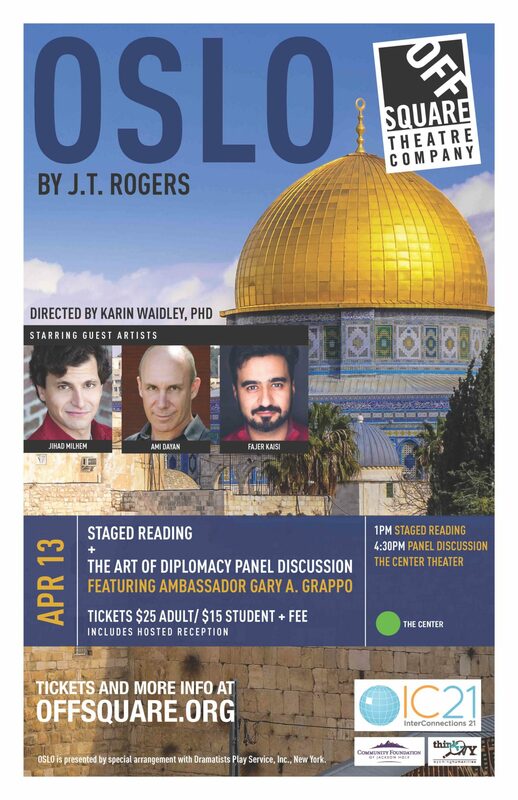 A darkly funny and sweeping play, OSLO tells the surprising true story of the back-channel talks, unlikely friendships, and quiet heroics that led to the Oslo Peace Accords between the Israelis and Palestinians. J.T. Rogers presents a deeply personal story set against a complex historical canvas: a story about the individuals behind world history and their all too human ambitions. 4:30 pm — Panel “The Art of Diplomacy” featuring Ambassador Gary A. Grappo, including Q&A, followed by dessert reception in the lobby.